Today is the Day Pentecost, which falls 50 days after Easter Day and 10 days after the Ascension. As the disciples were coming together to pray, ‘suddenly from heaven there came a sound like the rush of a violent wind, and it filled the entire house where they were sitting.’ Divided tongues, ‘as of fire,’ danced above their heads, and ‘all of them were all filled with the Holy Spirit and began to speak in other languages, as the Spirit gave them ability’ (see Acts 2: 2-4). Later this morning [4 June 2017], I am celebrating the Pentecost Eucharist in Saint Mary’s Church, Askeaton, Co Limerick, at 9.30 a.m., and in Saint Brendan’s Church, Kilnaughtin, in Tarbert, Co Kerry. This is a bank holiday weekend in Ireland, and so I prepared my sermons long before some friends arrived on Friday to spend the weekend at the Rectory in Askearton. But as I was working on those sermons I found myself returning to thoughts I had four years ago as I was preparing a sermon for the Day of Pentecost in 2013. I was reminded then of ‘Little Gidding,’ which is the fourth and final poem in TS Eliot’s Four Quartets and is Eliot’s own Pentecost poem. In ‘Little Gidding,’ Eliot combines the image of religious renewal with the image of the London air raids and the constant fighting and destruction within the world. This compound image is used to discuss the connection of holy places with the Holy Spirit, Pentecost, communion with the dead, and the repetition of history. Eliot visited Little Gidding in Huntingdonshire only once, in May 1936. There Nicholas Ferrar had formed a small Anglican community over three centuries earlier in 1626. The community at Little Gidding lived according to Anglican principles and the Book of Common Prayer. However, the community was scattered during the English Civil War and eventually came to an end with the death of John Ferrar in 1657. 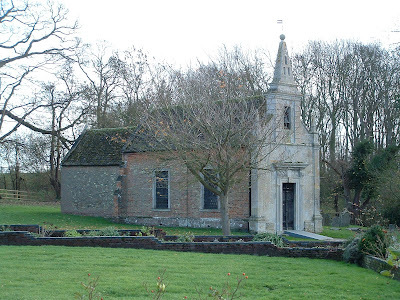 The church at Little Gidding was restored in 1714 and again in 1853. Although Eliot visited Little Gidding in May 1936, this poem was not published until September 1942, having been delayed for over a year because of Eliot’s declining health and the air raids on London during World War II. ‘Little Gidding’ deals with the past, the present, and the future, and humanity’s place within them as each generation is seemingly united. The poem focuses on the unity of past, present, and future, with an understanding that this unity is necessary for salvation. In this poem, humanity’s flawed understanding of life and turning away from God leads to a cycle of warfare, but this can be overcome by recognising the lessons of the past. ‘Little Gidding’ is a poem of fire with an emphasis on purgation and the Pentecostal fire. The beginning of the poem discusses time and winter, paying attention to the arrival of summer. The image of snow, which provoke desires for a spiritual life, moves into an analysis of the four classical elements of fire, earth, air and water and of how fire is the primary element of the four. This is followed by a discussion of death and destruction, things unaccomplished, and regret for past events. The poem then describes the Battle of Britain and the London Blitz in World War II. The image of warfare merges with the depiction of Pentecost, and the Holy Spirit is juxtaposed with the air raids on London. Humanity is given a choice between the Holy Spirit or the bombing of London; redemption or destruction. God’s love allows humanity to be redeemed and to escape the living hell through purgation by fire. At the end of the poem, Eliot describes how he has tried to help the world as a poet. He meets a ghost, who combines various poets and literary figures from the past, including Dante. Speculation about the other poetic and literary figures contained in this spectre includes Virgil, William Shakespeare, John Milton, Jonathan Swift, Samuel Johnson, and the Irish writers WB Yeats and James Joyce who had died recently, or even the shade of Nicholas Ferrar. Eliot and the ghostly figure or spirit discuss change, art and how humanity is flawed. The only way to overcome the problems of humanity’s flawed condition, according to the ghost, is to experience purgation through fire. The poem concludes by explaining how sacrifice is needed to allow an individual to die into life and to be reborn, and that salvation should be the goal of humanity. (Revd Canon Professor) Patrick Comerford is Priest-in-Charge, the Rathkeale and Kilnaughtin Group of Parishes in the Dioceses of Limerick, Killaloe and Ardfert.